Early in the development cycle, something unusual occurs. The marketing and engineering managers agree. No joke, in my past product development experience this is the most comfortable time for those two teams to work together. The marketing team outlines all of the crazy customer requirements, while the engineering team signs up to solve every one of those ludicrous challenges. Take note that even in this early Idea stage, there is already outsourcing at play. From an engineering perspective, the marketing team is doing the work of developing product requirements. The marketing team is outsourcing R&D to, well, the R&D team. At some point, a deadline gets decided, and then havoc ensues. Still, that early stage of defining what a new product will be is euphoric. After a couple of rounds of compromise, a production definition emerges. Which means it is time to move on to the design. What if “we” do not have a team? The situation from above works great when there are marketing and engineering teams. If you are a one-person shop or maybe you do not even have a marketing person, what can you do? You can look for an outside partner to help. You might be thinking “consultant,” and that is partially correct. However, be careful in hiring a consultant that can help only at this early stage. When working with a versatile partner like an electronics distributor, you can gain access to a breadth of resources a smaller firm cannot match. Also, they have room to grow with your design since they can cover the entire process. Once product requirements and engineering capabilities are determined, it is time to move into design. While I do not mean to suggest you can outsource the entire design block, there might be opportunities to outsource or partner within this block. For example, how much of your time should be spent finalizing component selections? How much industry experience do you have for something like a transducer? 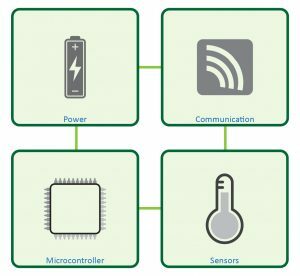 When thinking about the blocks for an IoT device, it can be broken down into four components or sub-circuits. Consider the sensor block for a minute. With the rate that sensor technology is evolving, it is understandable that we want to focus an inappropriate amount of time on our device’s sensor(s). They are exciting. Learning the material science behind a new sensor type is fun. However, it is also time-consuming. Even after reading numerous white papers and watching every technical video you can about MEMS technology, you could come to a harsh realization. The technologies you put this considerable learning effort into, are not an ideal solution. If you are evaluating on your own, looking at the many sensor types is time-consuming. Do you use traditional, or established technologies? What are the advantages and disadvantages of a MEMS technology? 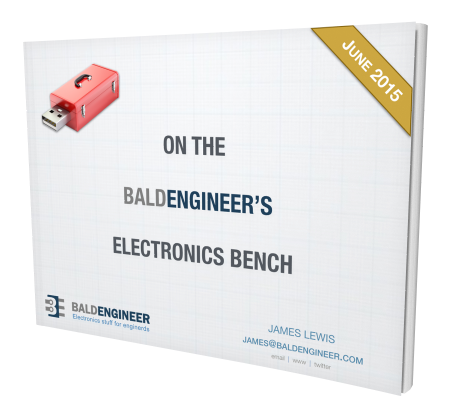 Are the lowest cost options RoHS compliant? There are many new or unknown players when it comes to new sensor technologies. Keep in mind unproven manufacturing processes may result in low yield, which increases production risk. Exceptional sensor companies tend to get acquired by a large corporation. The downside to acquisition means the new owner may change the roadmap, which will impact your production schedule. Do not overlook a partner company that can help fulfill that role. Distributors have entire teams of experts who specialize in every aspect of the supply chain. Field Application Engineers are available for nearly every product category they offer. Instead of relying on your limited research scope, leverage theirs. Once you make it through the design, it is time to consider where you are going to buy all of the components in your schematic. Finalizing a design and selecting the components is not the end of the new product cycle. Instead, it is just the beginning of the Sourcing stage. The sourcing stage is where you buy all of the raw materials, or components, necessary to build your IoT device. A finalized product is an assembly. That assembly is composed of subassemblies. A sub-assembly includes components, circuit boards, and mechanical pieces. For example, a circuit board populated with components might be a subassembly. The subassembly going into a frame with mounting hardware, like screws, and another printed circuit board, would be the next level of assembly. And so on until you work your way up to the top. Every single item in your product has to be sourced. In some cases, you are sourcing a finished component like a capacitor or screw or IC. In other cases, you might be sourcing raw materials that get processed during manufacturing. If you are using a metal case, are you buying pre-fabricated cases? Alternatively, are you purchasing raw steel and manufacturing the case yourself? Unless you have specific job experience in managing a “costed BOM,” I highly recommend working with a partner for sourcing components. Not only do they have best practices to cost-down a design’s bill of materials, but they also have way more leverage in the channel than you. Take advantage of what they can bring to the table in this area. It becomes even more advantageous when it is time to build. As I stated before, I do not think most of us will second guess the idea of using a partner to manufacture our products. What you should consider, though, is the effort necessary to work with these manufacturers. In this case, I think about trials and tribulations that the designers behind Keyboard.io went through. It was a crowdfunded project, and they attempted to handle all phases themselves. The area that slowed their production down the most was finding a manufacturing plant in China to produce the milled wooden cases. The lowest tech part of the project cost them the most time. Chances are your product has a well-defined target region that most of us call “the world.” Or as marketing types put, global. How are you going to deliver from the manufacturing plant to your end customer? Are there intermediate shipments that need to occur? For example, do you need to receive your finished assembly from one plant, your box from another, and the instruction manual from a third? Or did your manufacturing partner help there? Finally, do not overlook long-term support. Keeping your entire bill of material with a single supplier means a one-stop look at potential shortages and their solutions during the whole lifecycle of your product. Remember that the core of IoT is the ecosystem. Both figuratively and literally, it is not possible to develop an IoT product in a vacuum. Question: Where are you at with your IoT product? Is there a stage you can outsource to a partner while you focus on your core contribution? Have you ever tried to do it all on your own–how did that go? You can leave a comment by clicking here.